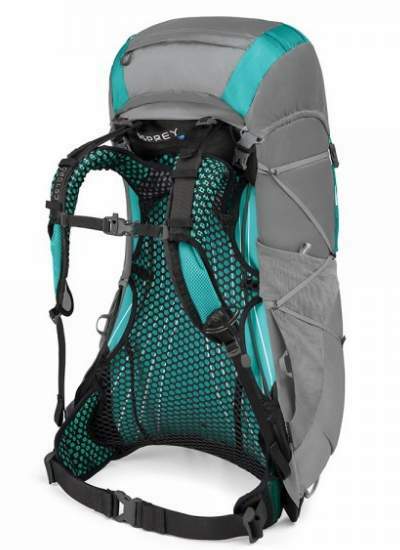 Osprey Eja 38 Pack For Women is the smallest ultra-lightweight backpack from a new 2018 series, with an internal frame and excellent ventilation based on a trampoline style tensioned mesh. 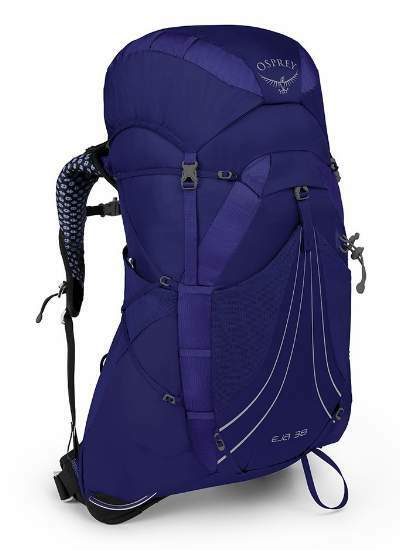 Osprey Eja 38 backpack for women – front view. The tensioned trampoline style mesh with excellent ventilation. Stow-on-the-Go attachment system for poles. Here you have a completely new series by Osprey, which they launched in 2018 as the women’s counterpart of their Exos series for men, which has been around for several years already. So this year they built this three-packs series which also includes Eja 48 and Eja 58. But they have also rebuilt the Exos series, so you might be surprised when you see those new versions. The general structure of the Eja series is the same as the new Exos, this is just about a women-specific design. All packs are top loading internal frame backpacks with a rather simplistic design and all here is done with the idea of shedding the weight. 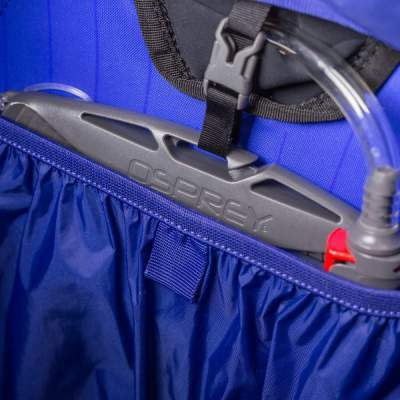 The lid is floating type and you can raise it if you have more load, but you can also remove it completely and close the pack with the integrated FlapJacket panel which is equipped with buckles. This flap is not removable. 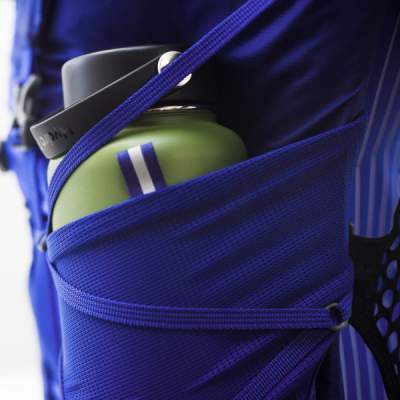 In the main compartment, you have only a sleeve for a hydration bladder equipped with a loop and a buckle to attach a bladder, see the picture below. Similar to Exos packs, there is no bottom compartment here. Very deep side mesh pockets and side straps. 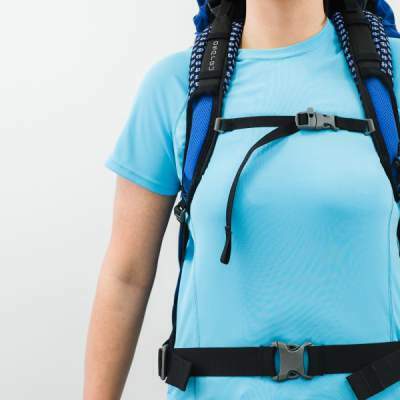 Being a model for women, the pack has a harness cut wider through the collarbone and an ergonomic taper in the chest area and the colors are different from the Exos packs for men. Also, the three sizes, XS, S, M, are with smaller volume and weight as compared to the corresponding sizes for men. With 38 liters of volume (for the M size), this pack is still good enough for day tours. One of my own favorite packs is 38 liters and I use it both for day tours and overnight tours. So the Eja 38 can be used the same way. The pack is certainly very useful for travel as well. Note that there is no torso length adjustment, so choose your size properly at the moment of purchase. Some small adjustment, as usual, are possible with the shoulder straps and with the load lifter straps. If you are in between two sizes, and if you are not completely sure, it is better to go for a larger size; at least this is what I think but you can try and see what the best for you is. 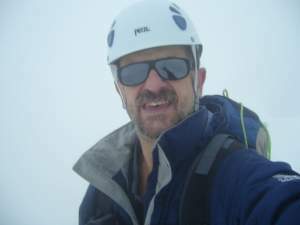 The body material is 100D high tenacity nylon, the accent is 100D high tenacity nylon triple check dobby, and the bottom is 210D high tenacity nylon. The designers of this pack have done everything to shed the weight and they have managed it greatly, so the packs have the weight 1.11 – 1.14 kg, dependent on the size, and this in spite of the metal frame which you have here. The peripheral frame is 6065 aluminum and it gives tension to the back trampoline style mesh. This is a really nicely done structure which keeps the pack completely separated from the body. So the pack itself is rather curved and it is never in touch with your back. I know that some complain that such a profile shifts the weight away from the body and it may cause a bit of disbalance, but I have been using such packs in the past 2 decades and I know they work well. There is no better design for air circulation. You have a very similar system used also in the smaller packs from yet another Osprey’s new 2018 series, and you can see it in the Hikelite 26 and Hikelite 18 packs. The padding on the shoulder straps is again nicely designed and with a very breathable and cool looking mesh and the same structure is on the hip belt fins. Those fins on the hip belt are quite short, but they might work better for women than for men (in the Exos packs) because of the difference in the body shape. Some (men) complain that the packs from the Exos series tend to slide down and the weight is carried on shoulders, which is certainly not so great. Though this is not so for everybody and it depends on the body shape. But women’s body in the hip area is differently shaped, and the minimalistic belt of this type might work better. I think this pack should be able to support the prescribed maximum load of up to 30 lb (14 kg), but with such a hip belt design it is better to stay below this limit. In view of its minimalist design, there are no many pockets. Two are on the lid, one is external and yet another mesh pocket is underneath the lid. You have one stretch mesh pocket with a dual access on each side of the pack. One really large stretch mesh pocket is on the front, equipped with a buckle on the top to secure things in it. You have 6 webbing loops for attachment of gear on the lid. There are also 3 webbing loops on the front on each side, so 6 in total, and with some extra cord, you can attach any larger object here. 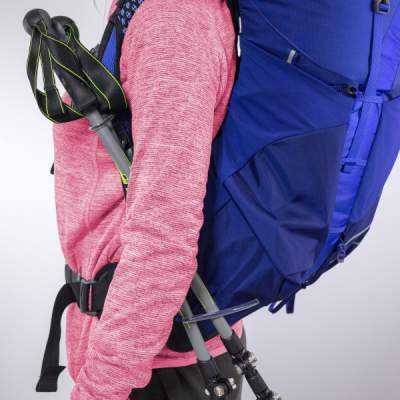 This pack also comes with the Osprey’s Stow-on-the-Go attachment system for poles, which includes a bungee cord on the left shoulder strap plus a loop on the side of the pack, see it in the picture below. Sliding sternum strap with a whistle. The side compression straps are very narrow and removable and they zig-zag along the sides of the pack. On the bottom, you have an equally narrow and removable strap. The pack comes also with a loop for the ice axe, and it is in pair with a bungee tie-off higher on the pack. There is a sliding sternum strap with a whistle, shown in the picture above. Not enough padding on the hip belt. The Volume/Weight ratio here is 33 l/kg, so this is a really great number, among the highest for the packs in this size range, and this in spite of the fact that it has an internal metal frame. As you see, some features are missing, but this is related to the minimalist philosophy behind this pack’s design. – XS: 2.45 lb (1.11 kg). – S: 2.48 lb (1.12 kg). – M: 2.51 lb (1.14 kg). – XS: 1953 in³ (32 l). – S: 2136 in³ (35 l). – M: 2319 in³ (38 l). – XS: 25 x 16 x 12 in (64 x 41 x 30 cm). – S: 27 x 16 x 12 in (69 x 41 x 30 cm). – M: 29 x 16 x 12 in (74 x 41 x 30 cm). – XS: 14 – 17 in (36 – 43 cm). – S: 16 – 19 in (41 – 48 cm). – M: 18 – 21 in (46 – 53 cm). Maximum weight: 30 lb (14 kg). So this was my Osprey Eja 38 Pack for women review. You have again an Osprey’s item with several great features and with the weight which is hard to match. But some features are missing, so check carefully what is essential for you and make an informed decision. The purpose of this text is to show you what the pack has and what is missing, and to show some other options. But in any case, the Eja 38 is a quality pack, you would not expect anything less from Osprey, and I can fully recommend it. Thank you for reading, if you need something different please check my page with packs in this size range. Check this Deuter Aircontact Lite 35 + 10 SL if you need a pack with a very substantial hip belt padding. In the case of questions or comments, please use the comment box below. I had to return the Eja 48 today. It’s a beautiful pack with top materials and it is lightweight. The distribution of the weight is fantastic. However, it has a major design flaw in the belt… the padding is too thin and the fins on the belt are not long enough to reach the front of my hip bone, which is amazing considering that I am thin. Another disadvantage is the lack of the belt pockets as they are very useful for storing the phone and energy bars. I can’t understand why this women version was not designed with the belt of the 2017 Exos model because the weight difference would have been very small. What a disappointment! I will continue using my Aura 50 despite the extra 700 grams! Hi Lorena, so bad to hear about your experience, but this is not a surprise to me, the hip belt fins are indeed not nicely designed in this pack as I pointed out in my review. As for the hip belt pockets, this is visible in the pictures at Osprey’s site and at other places like Amazon etc., pity you did not notice. The problem is not only with women’s version – the new versions of Exos are with the same design, there are no hip belt pockets and the belt fins are the same design as in the women’s packs. They have also removed the shoulder straps’ pockets.